How many of you, like me, make goals at the beginning of each year and then by April, or even March, those goals have gone out the window? 2010 is going to be different! Run the Hobble Creek 1/2 Marathon in August 2010! Make your goals specific so you have no wiggle room. Set a date when you will accomplish your goal and get going! If you tell someone you are doing something, you are more likely to do it. Convince a friend to train for your 1/2 marathon with you, start a goal journal that you report to each night, blog about your goals and tell your readers you will be reporting to them each week, etc. Reporting your progress or lack of progress on a continual basis is a good way to keep motivated to do better. You guys ready? Good! Hope your 2010 year is happy, prosperous and goal oriented! P.S. 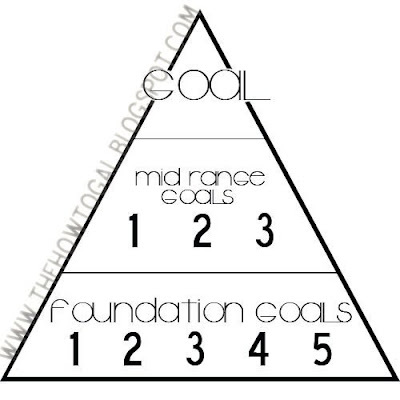 If you would like a copy of the Goal Pyramid, just email me the.how.to.gal@gmail.com and I will send you a PDF version! What great goals you have! I love your pyramid, very clever! I'm a runner to, so I have similar goals! Stop by and visit me sometime! Of course you can link to it Ashley! Do you want the original image so it is larger? Great post! I would actually like to train for a 1/2 marathon this year as well. I have never run in a race and I only discovered I enjoy running last year. And chocolate covered raisins are my fav. Don't you feel like it's one of the dorkiest candies? :) Anyway, thanks for visiting my blog. We'll have to keep in touch on how our training is going!